More bits of tid from the InDesign CS3 Help file. In this episode: pages 51-100. Right-click/control-click an empty spot in the document window to get a lite version of the View menu at your cursor. (grids and guides controls, display performance, rulers, zooming). Ruler guides come in two flavors, page guides, and spread guides. Spread guides stretch to the edges of the pasteboard. To create a page guide, drag out a guide and drop it on a page. To create a spread guide drop the guide on the pasteboard. 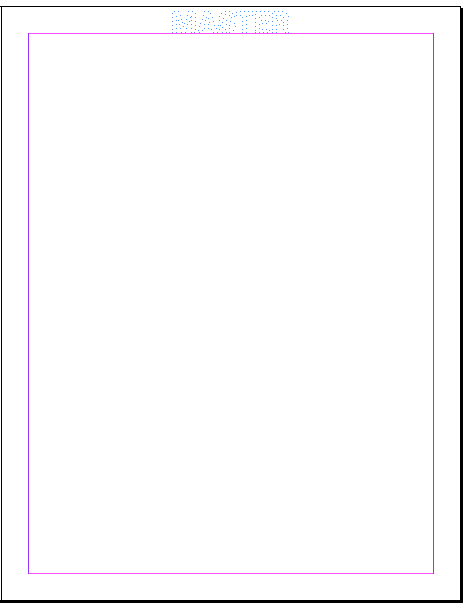 To create a spread guide when you are zoomed in (i.e can’t see the pasteboard), press command. Double-click the ruler to create a spread guide without dragging. Hold shift to constrain a guide to the nearest tick mark. Command drag from the ruler origin to create crossing guides. Reposition a ruler guide numerically by editing its x/y coordinates in the Control panel. Control click with a guide selected and choose Move Guides to move them precisely. Remember: columns created with guides do not control text flow on import. Create Guides command creates page guides only, not spread guides. Hey Adobe how ’bout a choice? You must target the spread/page you want to drag the guide onto from the pages panel or it won’t work. To evenly space existing guides, select them and distribute, using the Control panel. To show/hide guides on one layer only, DC on the layer name in the Layers panel. Why can’t I select this ! @#$% guide? It’s on locked layer or it’s a master item. Cut/copied guides can be pasted to other pages or even other docs. Guide weirdness, (but it is technically correct): if you drag a spread guide up or down and release it on anywhere on the page, it turns into a page guide. D’oh! Cool Beans: hold alt/option as you drag a guide to make the current magnification level the view threshold. cmd-opt-g should be called Select All Visible Guides, as it won’t select guides below the view threshold. But choosing Layout > Create Guides…Remove Existing Ruler Guides gets ’em all. Obvious but worth stating: putting guides on different layers doesn’t affect them visually. They’re always above columns and margins, and in front of/behind page objects (depending on your pref setting). When both Snap to Grid and Snap to Guides are selected, Grid snapping takes precedence. Guides must be visible for things to snap to them, but grids don’t. Snap to Guides is layer-agnostic. The “snap to” zone is measured in pixels. A nice, neat definition of masters: pages or spreads that automatically format other pages or spreads. Targeted vs. Selected pages: targeted page numbers are reversed in the Pages panel, selected pages are blue. Betcha never noticed that the vertical ruler is grayed out beside non-targeted spreads. Good to know if the Pages panel is out of sight. Select a spread by single clicking on the page numbers. To dupe a spread, drag page numbers to the new page icon..
or press alt/opt and drag to a new location in the panel. Whew. brackets around page numbers means you’re looking at an “island spread.” That is, someone turned off Allow Selected Spread to Shuffle. 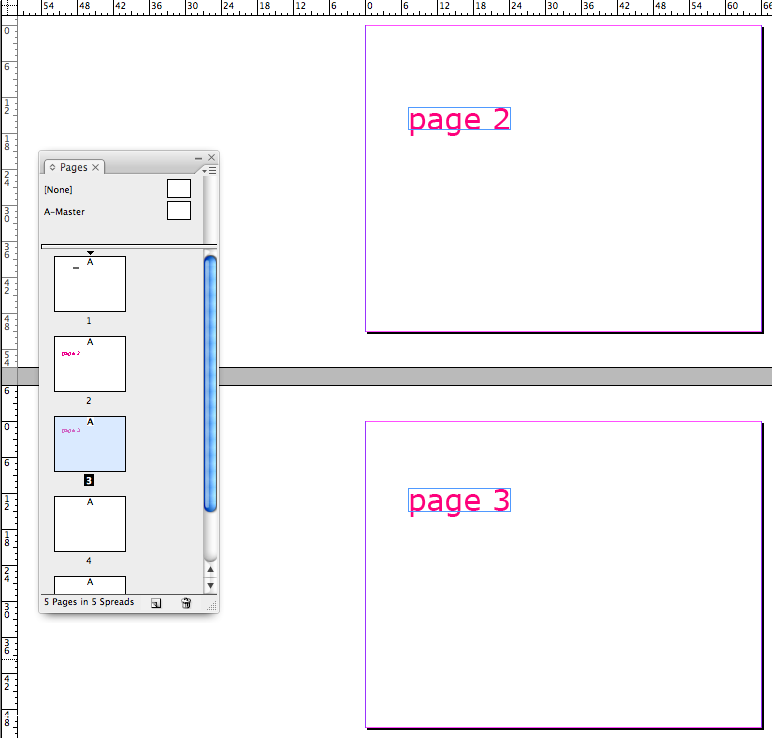 10 pages is the max for a spread. How many more do you want? When you drag a page to another doc, the receiving doc’s versions of identically named masters, styles, and layers win out. If you copy a different size page size, it will be re-sized to match the receiving doc. Master page objects appear behind page objects from the same layer. Put a master item on a higher layer to have it appear in front of other page objects. It will still retain its mastery. Wow! To apply a master page to multiple pages, select them then press alt/opt as you click a master, or (yawn) choose Apply Master to Pages. So.. instantly remove all master items by selecting a page and option clicking on the None master. Clean up after yourself: Select Unused Masters to delete trash ’em. Overriding v. detaching master items, you must override before you can detach. You can override only if Allow Master Item Overrides On Selection is checked. Wow: cmd-shift click and drag to override multiple items at once. If you override a threaded text frame, all visible frames in that thread are overridden. Wow: master items that don’t allow overrides have no frame edge and are un-selectable on a doc page. See Ghost in the Machine. You cannot restore detached master items, but you can reapply the master, and delete the detached items. when importing a master from another doc with the same name, choose Replace Master Page = source overrides destination. The number of layers a doc can have is limited to the RAM avail to ID. Hmm, so what happens when you make a doc with a jillion layers, then open the doc on a machine with less RAM? Let’s hope we never find out. Wow: to create a new layer above the selected layer (instead of atop the stack) hold ctrl/cmd as you click New Layer. What appears in a layer color: the dot in layer panel, frame selection handles, bounding box, text ports, text wrap bound, frame edges, and hidden characters, and text threads. Deja vu: New Layer, Duplicate Layer, and Layer Options all have the same dialog box. To select all objects on a layer, opt click the layer. To move objects to a hidden or locked layer, hold cmd/ctrl as you drag. To copy the objects add opt/alt. Paste Remembers Layers forgets an awful lot. When you have it on and move objects to a different doc, the only thing that comes is the layer name, not the layer’s options or its place in the stacking order. Picking locks: objects on locked layers can change, e.g. if you applied a swatch and then change the swatch. Anything using the swatch on the locked layer will change. More selecting vs. targeting: you can select multiple layers, but target only one. 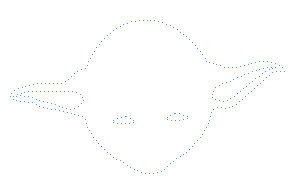 When you merge layers, all objects from selected layers move to the target layer. ID vocabulary: paths vs. frames. 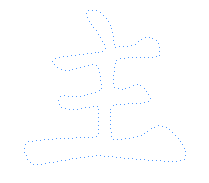 Paths are vector objects, frames are identical w/one difference: they can be containers for text or graphics. OK, two diffferences, frames have the X inside them. You create frames by placing or pasting contents into paths. A frame is a container version of a path. Now it makes a tiny bit more sense that there’s a rectangle tool and a rectangle frame tool……………………nah, I still hate it. If you click inside a frame you select it. Not so with a path. Don’t tease me, bro: when a frame contains text or graphics you can’t redefine it. But the menu choice Object > Content isn’t grayed out. You have to choose it to see all the choices are unavailable. Actually this goes for all menus. You have to navigate to the sub-menu before you can see it’s a dead end. A doc can have only 1 chapter number assigned to it, use sections for a multi-chapter doc. The 4 functions of sections: restart page or chapter numbers, change numbering style of chaps and pages, add prefixes and section marker text to the numbers, also section markers can appear in TOCs and indexes. If you want text variables to be present to all your future documents, set up the TVs with no doc open. You can use the Filename TV, with Include Folder Path, to always know where your doc lives. 3 things you can do when deleting a TV: replace it with another, clear it, or convert it to text. TVs are like Pinocchio-they want to be real living text, but they are just puppets. You can copy TVs to another doc when you synch a book. Adobe’s recipe for “a clean computer system”: defragment, use virus protection, remove old versions of software, “optimize” memory, and update drivers. My recipe: don’t eat Doritos at your desk. Garbage In: Damaged PagMaker and QXP files usually remain damaged when opened in ID. Troubleshoot the doc in the original app. Clear unnecessary data by doing Save As. When you do a regular Save, ID appends new info to the doc but doesn’t remove outdated data (e.g. info about deleted graphics). Seems a bit obsessive, no? Save as = smaller file, that redraws and prints more quickly–but by how much??? Head scratcher: Creating styles with no documents to open “can cause duplicate styles to appear when you create a new document.” Why? Even if you have identically named styles in a template file, you don’t get duplicate styles because the template’s versions win out. Head scratcher 2: to print separations, “use Adobe-conforming EPS, DCS or TIFF CMYK files only.” So PDF, AI, PSD don’t separate reliably??? Transform graphics before placing in ID, as ID sends the graphic in untransformed state to the printer, then appends it with the transformation instructions, which takes more time and more printer memory. File > Open can open ID 1.x and later, INX, PM 6, QXP 3.3, 4.1, and Passport 4.1, .indl and .indt. .indls (libraries) from earlier versions of ID will open and convert to CS3, even if they were locked. Semi-Wow: Drag assets from doc window into Adobe Bridge to create Snippets. But they have weird names, so you have to select and rename them in Bridge. Why didn’t I think of that? : Create an instructions layer with in a template explaining how to use it. Lock it and make it nonprinting. Saving a doc saves the layout, references to source files (aka links), info on which page is currently displayed, and the zoom level. Saving also updates metadata (thumbnail preview if the pref is turned on, fonts, swatches, file info). Wowish: Save all open docs: cmd-opt-shift-s.
A doc preview contains a JPEG (and on the Mac, a PICT) of the 1st spread. A template preview has JPEGs of every page, which you can see in Bridge. Saving a preview with a doc in the Save As dialog box overrides and change the application pref (Preferences > File Handling > Saving InDesign files > Always Save Preview Images With Docs). If your files have a lot of the same metadata, save metadata as a template: File > File Info, Save Metadata Template. Then your template is a choice in the dialog box and auto fills the fields. To get a free 100-page quickstart guide on switching from (and ironically, back to) Quark, go here. For better XPress conversions: emulate QXP by choosing Text Wrap Only Affects Objects Beneath, and Adobe Single Line Composer. QXP’s color profiles are ignored by ID. Embedded graphics are not converted. OLE or Xtensions graphics are not converted. Grouped items stay grouped, except for nonprinting items. Strokes and line styles are converted to those they most closely resemble. Custom strokes and dashes are converted to custom, well, custom strokes and dashes. Multi-ink colors become mixed inks, if they contain spots, otherwise they becomes process colors. HSB is converted to RGB. If you have trouble converting a large PageMaker doc, convert it in pieces. ID can recover most docs that PM can’t open. Hey wait a minute Adobe, back on page 90 you said garbage in, garbage out. Which is it? At least he’s honest: if ID can’t convert something, it displays a warning and the reasons it couldn’t do the job. All items on the pasteboard of a converted QXP doc appear on the PB of the 1st spread in ID.